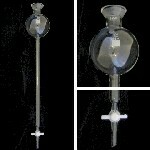 Borosilicate glass chromatography columns having a Teflon stopcock, reservoir of the listed capacity, an upper spherical outer joint and reinforced beaded top. 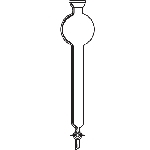 Column is constructed using medium wall tube. With 35/20 ball joint at the top. Reservoir size 250ml. ID 1/2in. Length 12in. Bore 2mm. Reservoir size 250ml. ID 3/4in. Length 12in. Bore 2mm. Reservoir size 250ml. ID 1in. Length 12in. Bore 2mm. Reservoir size 500ml. ID 1 1/2in. Length 12in. Bore 2mm. Reservoir size 1000ml. ID 2in. Length 12in. Bore 4mm. Reservoir size 1000ml. ID 2 1/2in. Length 12in. Bore 4mm.